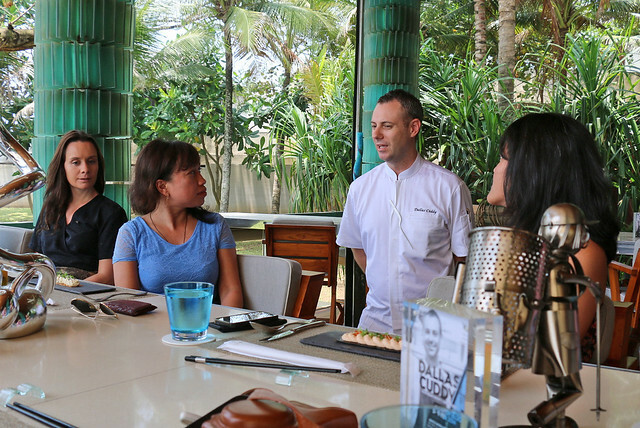 Dallas Cuddy of The Prime Society became guest chef at Starfish Bloo at W Retreat & Spa Seminyak in Bali, Indonesia last month. The Melbourne-born chef lent his Nobu-honed skills and sunny smile to beautifully designed lunch and dinner menus at the award-winning resort. This was where he had free rein to play with ingredients and let his creativity shine through. And it wasn't just his food that looked good, the dude is ridiculously photogenic - one shot (above) and I was done. Dang. That's too easy. 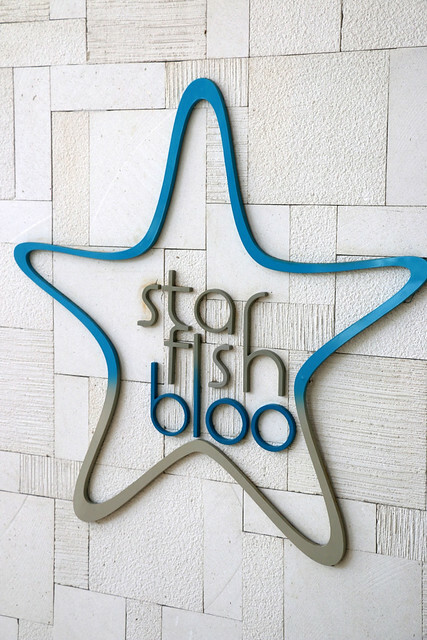 And what a gorgeous place the Starfish Bloo is. 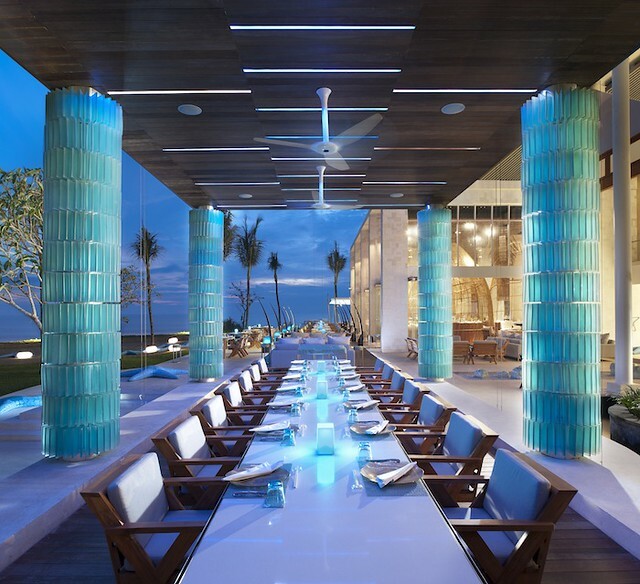 The Pan-Asian eatery is best known for local seafood and special signature creations. This is an official photo. Too bad I didn't think of taking pictures at sunset or twilight. Isn't it just stunning? 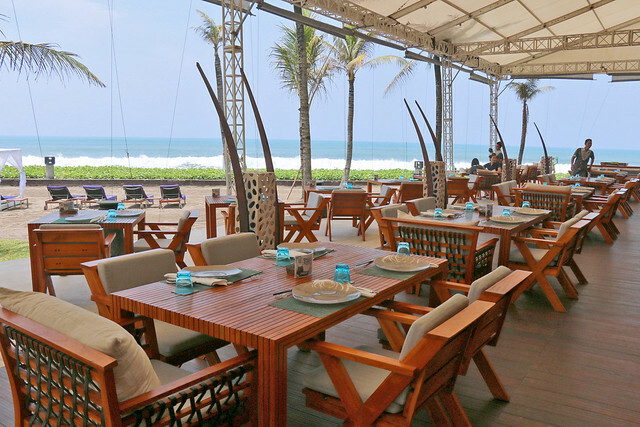 Starfish Bloo is also where you can enjoy a full breakfast/brunch against the picturesque backdrop of Seminyak’s sandy beachfront. It is blissfully warm - think weather in the 30s deg C (90s deg F), but the sea breezes help to diffuse the tropical humidity. (Boy, all the people freezing in New York and East Coast of USA this past uberwinter...yes, you need to come here). The W Retreat & Spa here is jawdroppingly amazing - I am doing a separate and detailed review on the resort (once I have finished ploughing through my 900+ photos). Want to see the Presidential Suite that Paris Hilton and Mika Häkkinen stayed in? Well, separately, I presume... Yes, will show you those luxurious pads in an upcoming post. But back to the food! 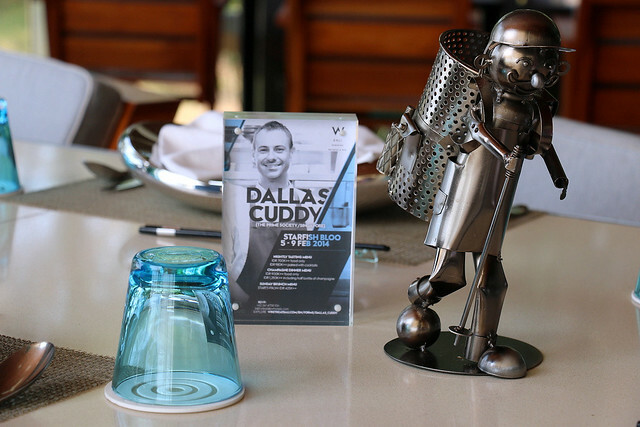 The W Bali had invited me to join the Dallas Cuddy media lunch, and it was such a privilege. We met wonderful people from the Indonesia media. 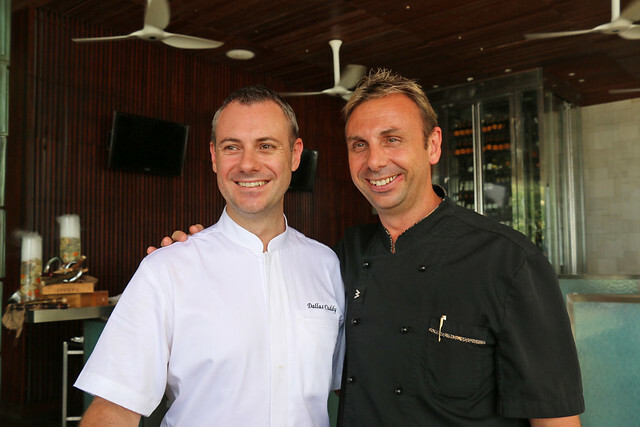 Here's Dallas Cuddy with Richard Millar, Director of Cuisine at the W Bali, who was also his mentor 10 years back in Australia. What a nice reunion. The first course took us on a taste and texture adventure right away. 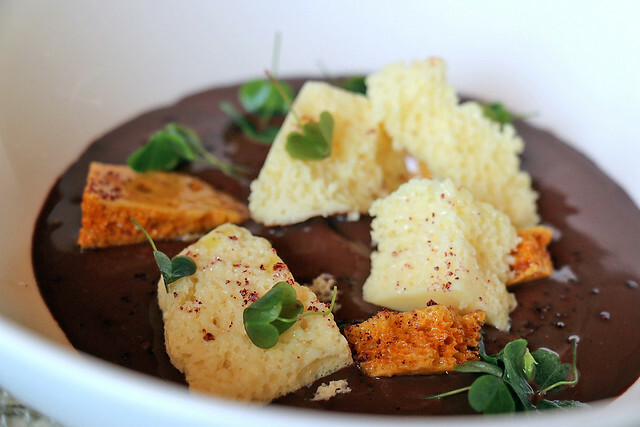 The soft whipped salmon custard contrasted with the crunchy squid-ink lavash. 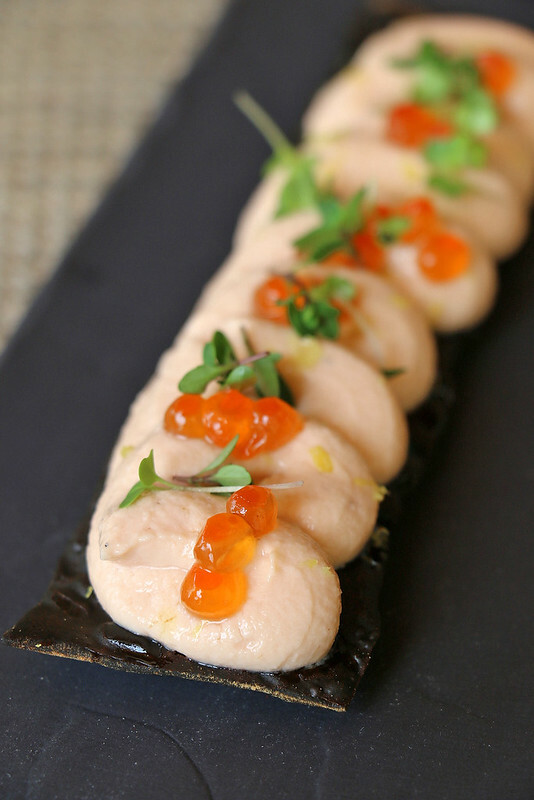 Hints of yuzu delicately perfumed the custard while the salmon roe added salty punctuation. The lunch came with cocktail pairings, concocted by the very talented Yudi Hendarsyah, Food & Beverage Manager at W Retreat and Spa Bali Seminyak. 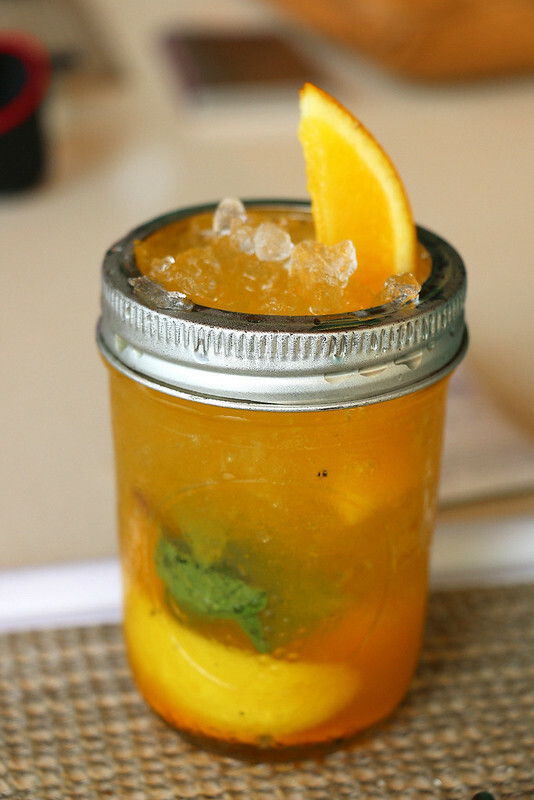 This is a delightful orange take on the usual lime-rum-mint mojito. Yudi would astound us with the various cocktails that he had conjured up just for this event. The fact that he is largely self-trained impresses us even more. Speaking to him, we could see that it was a deep passion for his craft that drives him to explore what works and what doesn't in the world of mixology. Clean and bold flavours came together here in the same showcase. The scallops were sliced real thin to melt in the mouth. 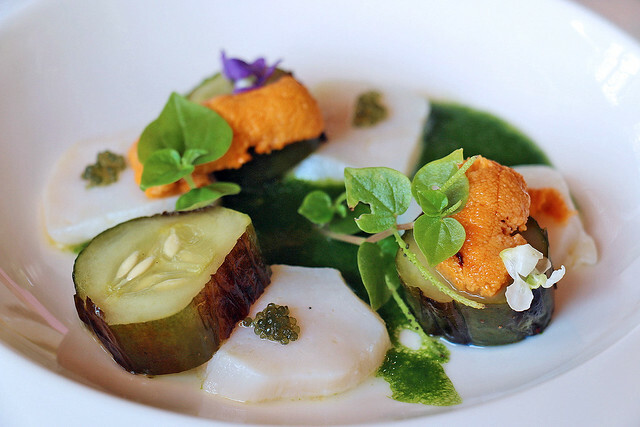 The mellow grilled cucumber makes an earthy backdrop for the briny rich uni. You can see the Japanese influence here. Nobu was a big turning point for Dallas. It was a whole new cuisine, like a new language to pick up. Japanese food focuses on light, fresh, subtle flavours and balance. Dallas finds that their respect for produce is amazing - from the whole life cycle and preparation of food, right down to filleting of fish. 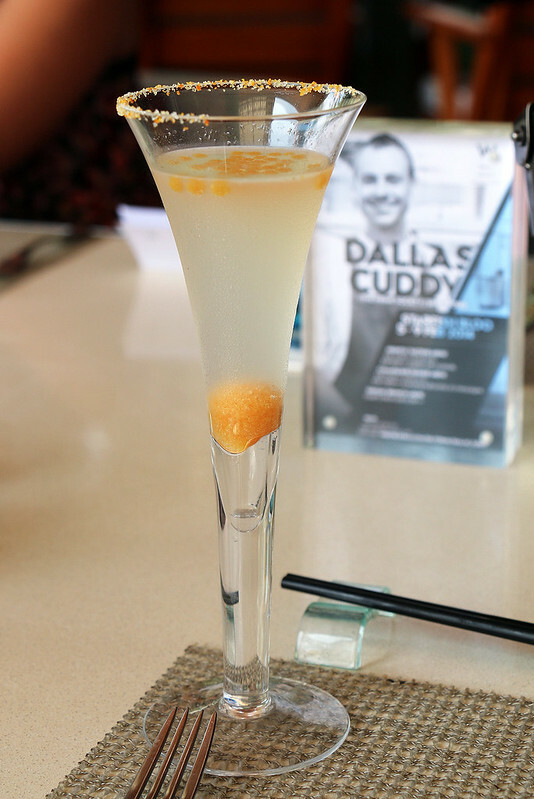 Blood orange spherification meets fizzy espuma carbonation in a fun and delicious drink. This was the course that won top raves around the table. The duck was roasted perfectly with flavours that blew us away. The dehydrated carrots proved amazing - it was not just flavour but colour that became more concentrated. And yet they retained a lovely sweet crunch. That orange sheet? 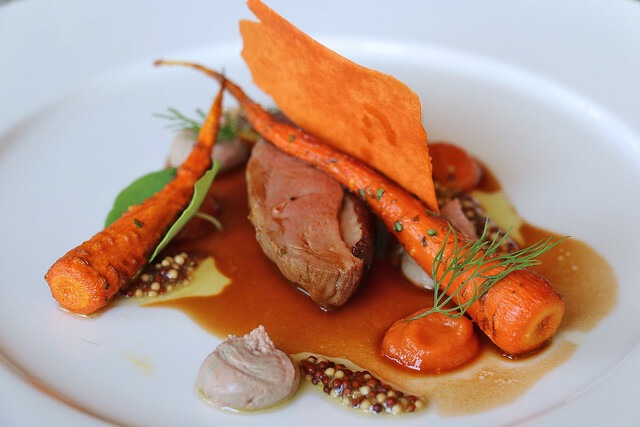 A candied carrot puree crisp that added even more textural contrast to the tender duck breast. Dallas likes different treatments of the same ingredient, so the three Ts - taste, temperature and texture - come into play across all his dishes. 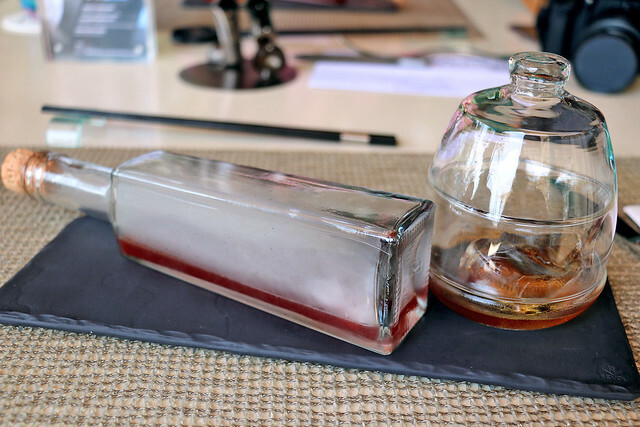 The W housemade cherry cola (with dry ice in bottle) is poured into a glass of Ron Zacapa dark rum with glass top. The results is a mysteriously billowing concoction that has the headiness of a good red wine - perfect pairing with the duck. Dessert came in an unexpectedly large bowl. I think chocolate lovers will go absolutely bananas, because this is the BEST chocolate I have ever had (and I'm not even a chocolate fiend). Yes, better than Valrhona or whatnot hoity toity high end brands. And guess what? The chocolate is produced from cocoa beans grown right here in Bali! Pod Chocolate is opposite Ubud, near the Sangeh Monkey Forest on the grounds of Bali Elephant Camp. Pity we didn't have enough time to hop over for a tour. The aerated white chocolate and crunchy honeycomb go well with the pudding, but I love the sprinkles of hibiscus salt that give a subtle lift to the sweetness. Turns out Dallas prefers savoury desserts (ah, me too!). This dessert has some Spanish influence - they have something similar made of chocolate, olive oil and salt. As if that huge bowl of chocolate nirvana was not enough, there's a dessert cocktail too. 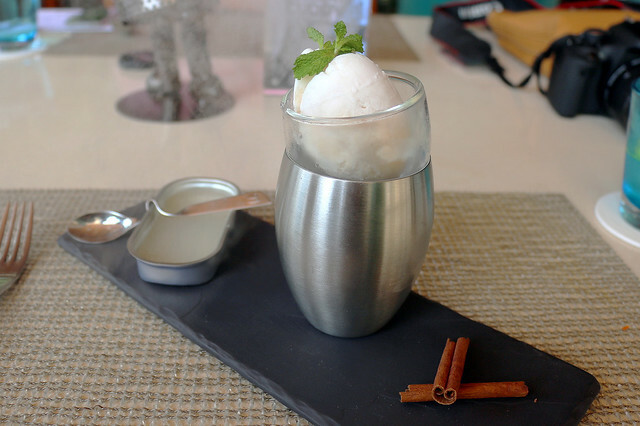 Lychee Vodka gelee with a scoop of frozen brandy, Baileys and lychee ice cream. The aroma of cinnamon powder is carried by more dry ice. Love the dented spoon served with the open can too. The nightly tasting menus ran from about IDR700K++ (~US$60++) for five courses and IDR980K++ (~US$84) with cocktail pairings, which I thought were really good deals, especially with the cocktails. I met some really nice Indonesian food bloggers - Ian (in pink shirt) of LyonandMia.com who also runs JKTgo.com, and Hans (in green shirt) who does Eats and Treats. 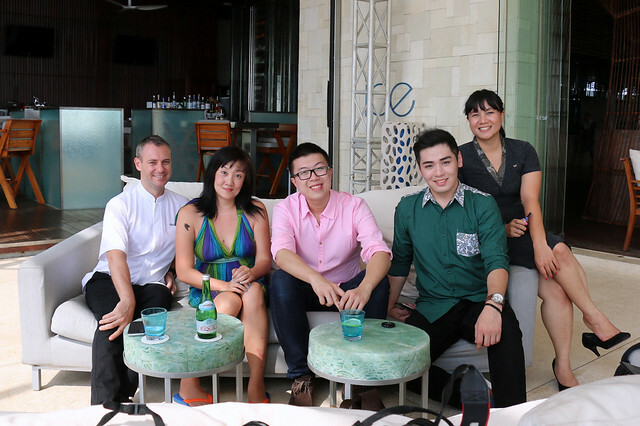 We were hosted by the lovely Aini (far right) from W Bali who took great care of us during our 3D2N stay. Dallas is a wonderful chef to talk to. He's known since the age of 12 that he wanted to be a chef, and his sporting background trained him to be competitive and strong-minded (endurance matters when you have to spend long hours in the kitchen with strong personalities). This stint at W Bali allowed him to showcase his techniques, teach the staff here what he knows, and come up with something we could all enjoy. He is also opening a new restaurant in Singapore this year, one that will offer food that is more along this playful style. It's a refinement he wants to get back to. I hope we get to hear more of that development soon. All photos (except where indicated) taken with the Canon EOS 70D kindly loaned by Canon Singapore. Ah, I miss that camera.